Good: Extensive checklist that covers every episode in first half of the show's run, well-written card backs that summarize each show, lots of autographs. 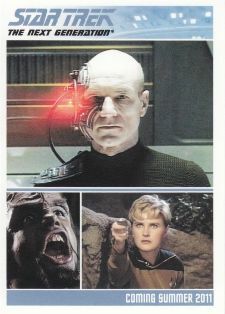 The Bottom Line: The Complete Star Trek the Next Generation Series 1 is a comprehensive look at the show's first four. 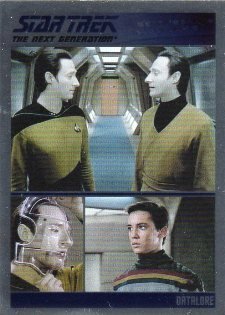 The first of two planned parts, it covers the first three-and-a-half seasons of its run, offering a card for each episode with five photos and a generous recap. The base set is extremely informative, but there's a just a little too much going on. The Aliens inserts suffer from the same busyness, squishing six pictures across both sides. At four autographs per box, there's good value, even buying a couple packs at a time. TNG fans will get the most out of the lineup of signers. There's some crossover appeal, but not as much as past sets. In some ways, I'm torn over the design. In all, each base card has five photos, which is too much. They are balanced out well but they're cropped so small they don't tell much of a story. Likewise, the Aliens inserts suffer from picture overload, presenting six pictures per card including very large borders. 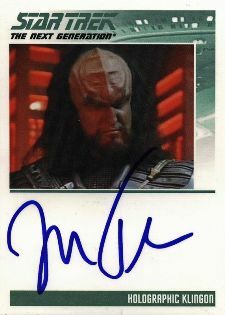 The autograph card design, which uses the same design as the autographs Rittenhouse used with the Quotable TNG several years ago, provides plenty of space for even the wildest of signatures. Squishing so many episodes into a single set is a daunting task. Rittenhouse has done a fantastic job of condensing so much information into it. The card backs have some of the most text I've seen in some time, providing a detailed overlook of the featured show. Where the checklist suffers a little is in the autographs. The signer list is very large, but the majority of them are from minor guest stars who haven't had a ton of major roles. There's also not as many main crew signers as past sets have had. For big-time TNG fans, this isn't a big problem as it provides a more complete picture of the show. However, the crossover appeal for non-TNG collectors will likely be limited. It's tough to beat four autographs per box, especially for TNG fans. The autograph lineup does have a few gems, like Joe Piscopo, Dwight Schultz and John Tesh (unrecognizable as a Klingon), but it's mainly guest stars. I found that even though I didn't recognize all the names or faces, many had roles in other shows and films I enjoy. The rare pin cards further add to the hit appeal. Collectors just shouldn't expect to find them very often. Although not a ridiculous amount, there's enough low-end inserts to further add variety and cut down on the base set duplicates. I'll be the first to acknowledge that I'm not the biggest TNG fan in the world. I respect it and look forward to one day plowing through the series. So coming at it from an outsider's perspective, I really enjoyed how much information was squished into the base set. It was also fun looking up the autograph signers to see where else I might have seen them and track what they're up to now. The most telling factor is that I'm looking forward to see what's in store for the inevitable second series. Although there hasn't been a lack of Star Trek-related sets, it has been more than six years since the last full release dedicated to the Next Generation spinoff. 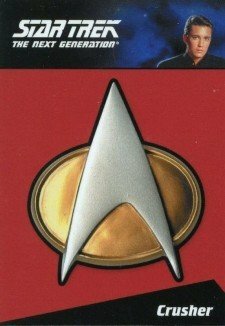 Rittenhouse Archives' The Complete Star Trek the Next Generation Series 1 offers an exhaustive look at the front half of the series. Boxes include four autographs. Signers include series regulars like Brent Spiner and LaVar Burton and notable guest stars such as John Tesh (Entertainment Tonight, singer), Joe Piscopo (Saturday Night Live) and Dwight Schultz (The A-Team). 88-card base set includes a card for each episode of the first half of the series' run. Base cards feature five photos and an episode recap. Autographs (49 cards, 1:6) include an extensive checklist of fan favorites and cross-over stars. Signers include Brent Spiner, Corbin Bernsen, John Tesh, Dwight Schultz, Joe Piscopo and LaVar Burton. 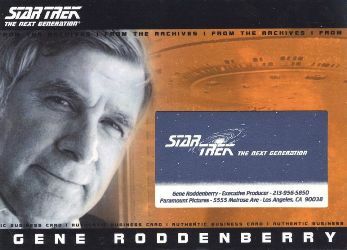 Gene Roddenberry Cut Signature Card limited to 30 copies. 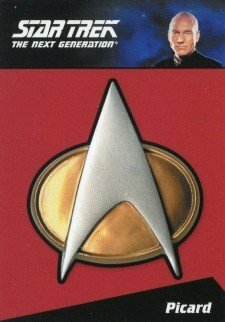 Bridge Crew Communicator Pin Cards (5 cards, 1:200). Tribute Cards (18 cards, 1:6) honor the stars and guests who have past in recent years. 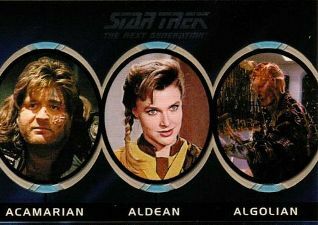 TNG Aliens (13 cards, 1:8) offer a look at the TNG universe's extra terrestrial creatures. Three are on each card. U.S.S. 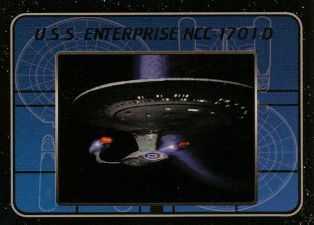 Enterprise NC-1701-D (9 cards, 1:12) spotlight the trademark ship.